With a small screen, the selection for buildings in unit selection is unavailable. Please add a scroll bar to this section so I can use the map editor again. New phone, can't figure out screenshots on it or I'd put one up. Notice how part of the icon for ranged units is invisible, and the icon for buildings is completely gone. @Stratego (dev) bumping this because it's a real issue for me. I use map editor to really examine things and I've been gone for months, so I'd really like to be able to use it again. That happens to me, just flip the phone or try tapping on the very bottom, you can sometime get the building. ok, in next update will be in. is u need in dev version (which?) than i can upload it now. Unfortunately the aof dev version crashes on opening, unless you fixed that already? If so please upload the fix so I can get to it. You may have to uninstall it, hopefully you don't have too much things. Unonstall reonstall. It might be because of new ids of ubits. It worked, thank you. Now another small screen issue. The icon at the bottom left for the menu is unavailable, so I can't change map settings. I hate this phone already. The one that shows number of TCS, castles, and several options....in map editor it lets you change number of players and races, add triggers, and add a description. Lower left corner during a game..... sorry, hope I'm describing it well enough. that is only visible if u dont have hardware menu button, if u have than u dont need it. Yup. That was the problem. Thanks again. I think I can get back to things without being as much of a pain now. 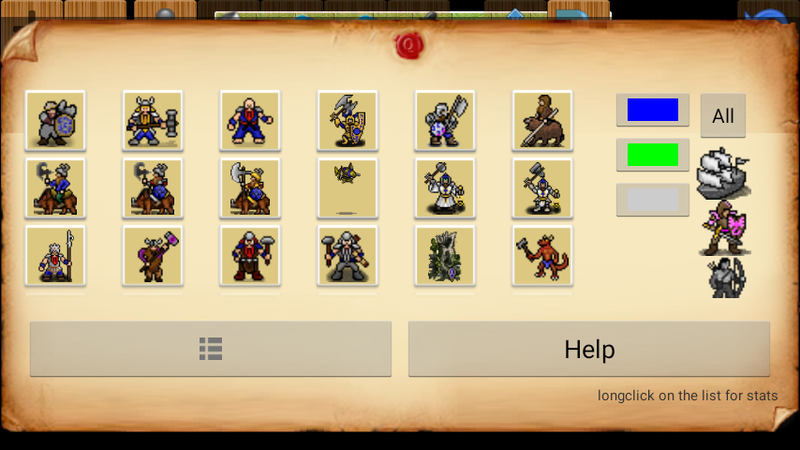 @Stratego (dev) On a related issue to the original here, can I get a scroll bar for player selection? I can select players 1-5 to assign units, but not player 6.
you mean the color buttons? Yes. Right next to the buttons you already fixed.